The story of Café Lygten goes all the way back to the 18th century. It has served as a tavern throughout all this time, but when I first learned of it, it was a rather sad little Indian restaurant. Only a couple of years ago the new young owner restored the place’s true heritage, but this time with a slight change in concept. Kroen is as pleasant and laid back as the German character – a gastro pub with antlers on the walls and roughly carved wooden tables and benches. The menu has bratwurst, sauerkraut, schnitzel… Simple Bavarian classics that differ on a monthly basis – vegan dishes will always be available as well. It’s prepared with love for rich ingredients and the fat hasn’t been skimped on! A wide selection of German beers flow from the taps and as a nice supplement, the little pub has kind of a hard rock vibe to it. On weekends local DJs spin everything from glam rock to country and blues rock on the turntables. 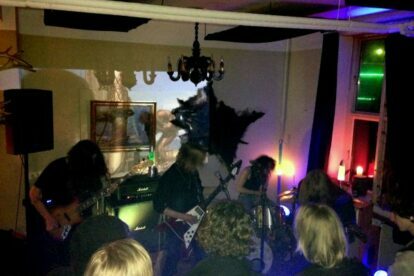 Kroen regularly hosts local bands for almost deafening rock sessions and international acts also swing by more increasingly these days. In addition, you’ll find yourself in one of the most diversely crowded bars… So you’ll fit right in! For all these qualities Lygtens Kro has become one of my regular spots! As a bonus, it’s only mere meters from my home. Maybe I’ll see you there.